But Portero is a stranger town than Hanna expects. As she tries to make a place for herself, she discovers dark secrets that would terrify any normal soul. Good thing for Hanna, she’s far from normal. As this crazy girl meets an even crazier town, only two things are certain: Anything can happen and no one is safe. From Goodreads. As soon as I read the first few pages, and saw Hanna talking to her father, who wasn't there, I was hooked. This book is just brilliant, and absolutely mental, but in a really good way! Portero is crazy, really just so odd! With every new occurance, and each new creature that made an appearance, I was thinking "Are you serious?!" with a huge grin on my face. 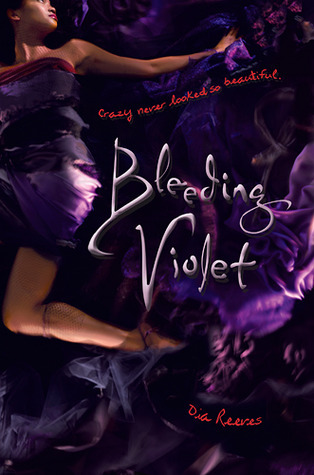 I've reviewed a fair amount of urban fantasy novels, and so I'm used to reading about strange creatures and happenings, but Bleeding Violet is written in a way that makes you stop and think "What? ", and it's just so awesome! I think it must be Hanna's narration. Being diagnosed and misdiagnosed with several different mental illnesses, as the story goes on, Hanna is never sure if the things that are happening are real or made up, and it's her surprise and yet easy acceptance of what's going around her that make it a little more surprising for the reader than other urban fantasies. You know, I think I would go as far as saying the creatures and events that happen may more be conventions of a high fantasy, where as the characters, relationships, and just everyday goings on are very normal, or conventional of an urban fantasy. It's the meshing of the two that is just so awesome, yet so bizarre! Don't read everything I've said so far and assume this novel is a silly little fantasy where crazy things happen. There's nothing silly about it; Bleeding Violet covers some very serious issues. Hanna's mental illness is just written so well. Hanna's off-hand acceptance of the things she knows can't be right - the actual things that aren't "real" - is jaring. It's disturbing to read Hanna's thoughts on things such as suicide, and her actions when some things happen. It's so powerful! Another issue covered in Bleeding Violet is that of identity. Specifically, racial identity. Hanna's mother, Rosalee, is black, and her father, Joosef, is a Fin. Hanna spent the first years of her life in Finland, without her mother, and knows a lot more about Finnish culture, and references are made throughout the book. At one point in the book, Rosalee makes her a meal, and there's something on her plate she doesn't recognise. When Rosalee tells her it's Grits, she asks "Is it a black thing?" There's an underlying, very subtle thread of Hanna feeling like she's only half herself, for not knowing about her black heritage, and for not having her mother around, but also that she's an outsider because of her Finnish background, and the cultural differences between her and her peers. And then there's the unrelenting, desperate need to be loved. With her father dead, and a mother that doesn't seem to want to know her, Hanna feels quite lost; what is life without a parent to love you? The things Hanna goes through to try and impress her mother, in order to make her love her, or get a passionate reaction out of her, is heart wrenching, and it's so sad to watch her be rejected time and again. It's not all serious and heavy though. There is plenty of action, which is very well thought out, just amazing, but you'll be more surprised by what's happening at the time, and wowed by it after the fact. If I was to criticise this book in any way, it would be that the action scenes could be just a little longer. It's not a huge deal, I just like me a bit of danger! The characters are also brilliant! Hanna herself is strange, as you've probably guessed, but it's hard not to love her and feel for her! She's got such a great voice, and can be really quite amusing at times with her strange way of seeing things. Rosalee is just brilliant! Cold and unfeeling at times, which will knock you for six, but it's great to have such a character that'll make you react and feel so strongly! Wyatt, Hanna's love interest, is pretty sweet, really, but I doubt he'd like to hear that. He's clever, quick, and very powerful though, and a combination of Hanna and Wyatt together, well, it makes great reading! This really is a very powerful, strange and beautiful book! I absolutely adored Bleeding Violet, it's zany and quirky, but very poignant and touching. Such a great ending! You have to read this book! Unfortunately, Bleeding Violet isn't being published in the UK so far, but British readers will be able to order a US copy from Amazon UK, and other online bookstores. Thank you to Simon and Schuster US for sending me an ARC. Sounds strange...so I'll be reading it. I'm glad you liked it. Juju - Cheers! It's a shame you won't read this book, it was awesome! Happy New Year to you too! Nickles - That's awesome! I hope you enjoy it when you do! Kay - Thank you! I hope you enjoy it, it's such a great book! Oh, it sounds great! "Absolutely mental in a good way" sounds like my cup of tea! Thanks a lot for the review. Awesome review- I'm jealous. ;) I'll be checking this book out! This book sounds great. I definitely have this on my wish list!!! Jenn-ay - Awesome! I hope you like it! Sounds great! I've been wondering about this one as it has been popping up in book blog conversations a lot recently. Thanks for sharing the multi-faceted aspects of the characters....often times the details (such as this) can be easily missed. Happy reading! Hmm, I think I know what you mean by the whole high fantasy thing. The lures don't feel like the typical paranormal creatures stalking about YA paranormal romances. In fact, they kinda remind me of those monsters in RPG fantasy games my brother plays, but er, as I'm not well versed in the world of video games, etc, my impression may be dead wrong. Hee, my favourite aspect of this novel was the mother-daughter dynamics. You're so right, it's totally heart-wrenching. I linked your review here I hope you don't mind? ^^; If you do, just say the word and I'll take it down immediately. Thanks for commenting! I don't know computer games very well, but the lures and the giant leeches were two of the main things that I was thinking of when I said high fantasy conventions. It was brilliant, though!